Catalonia’s branch of the Boycott, Divestment and Sanctions movement against Israel suggested that European governments are “responsible” for a terrorist attack in the Barcelona area. 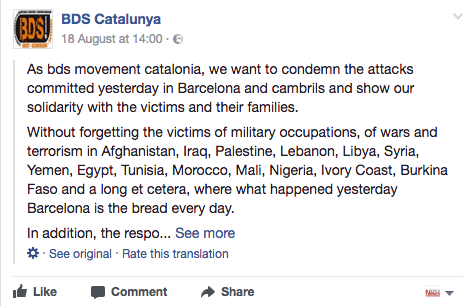 BDS Catalonia made the accusation on Friday, a day after the Islamic State terrorist group said its militants killed in the Spanish region 14 people and wounded another 100 in two incidents in and near its capital, Barcelona. “A movement based on hatred, the perpetuation of conflict and defence of terrorism like BDS cannot avoid proving at all times its immorality and double standard,” ACOM wrote in the email. “This is what happened in the latest lamentable statement by BDS Catalonia.